This post is a summary of the project portion of my Capstone for my masters in EE. 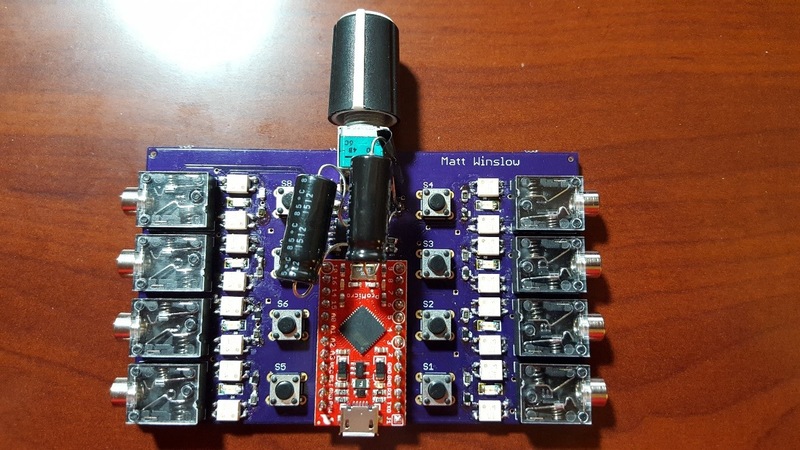 The audio multiplexer (mux) with integrated amplifier is a device that amplifies the audio signal with a volume control knob and has four selectable audio inputs and outputs. The inputs and outputs are selected by button presses. A microcontroller is programmed to take the button presses and power a corresponding set of relays to activate an audio jack. A power supply needs to be attached to the micro USB port on the microcontroller to power the relays and supply power to the amplifier circuit. A custom printed circuit board (PCB) has been created for this project to accommodate for functional use and be compact. The final project is a working device that satisfies all of the requirements. This project is to clean up my 3.5mm (1/8") audio mess I have at my desk. I have a few different sources; eg computer, tv, laptop, phone; and I have a few different devices that I want to output the sound to (headphones, speakers in different positions). I don't want to keep hooking up all these different sound equipments, so I made a simple audio input/output switch box. 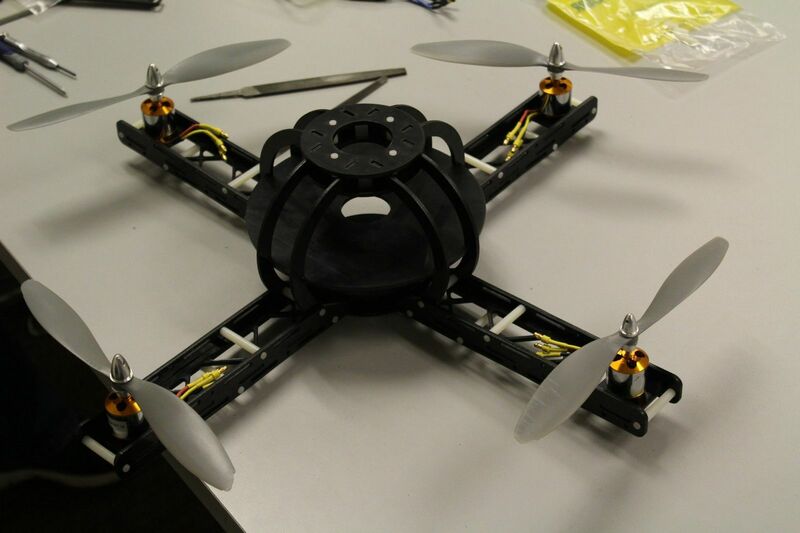 My senior design project is to design and build a quad copter frame. The end goal is to build a sturdy enough frame that can withstand impacts and crashes. I will also attempt to make it fly after assembly. This mod will show how to replace the green LED lights in the Xbox 360 controller. I found a solution to my previous problem of not being able to put the dvd drive back into the xbox after I installed a new hsf on the gpu. I decided to mount the dvd drive onto the top of the enclosure, along with another 100mm fan. It isn't very portable anymore, but it works for me. In this post I will show how to mount the dvd drive on top of the enclosure, add a 100mm slim fan, and change the 12v stock fans on the 360 from variable to constant power. If you mess anything up, not my problem, these steps worked for me. Opening your Xbox will void the warranty. Adding a fan to the gpu will get in the way of the dvd drive. You can skip this step if you want your xbox to look the same. This guide will include how to reflow, penny trick, and adding 12v fans to gpu/cpu. This is going to be a quick post on how to disassemble and oil a computer case fan to reduce noise and increase fan longevity. All you need to take it apart and oil it is tweezers and WD-40. I am using a 50mm fan, but this guide is still relevant for 120mm and most other fans.